One of the rites of summer around here at Butternut Gardens is seeing which variety of dahlia will be the first to bloom, and when it will happen. Some naturally bloom a bit earlier, but of the early bloomers, there is always a bit of variation. Two years ago, 'Bashful' broke the barrier on June 28. Last year it was 'Jitterbug', also on June 28, and this year, a red Karma won the race, but several weeks later owing to a late spring, and my delay in putting the tubers in the ground. left. It truly is the size of a dinner plate! 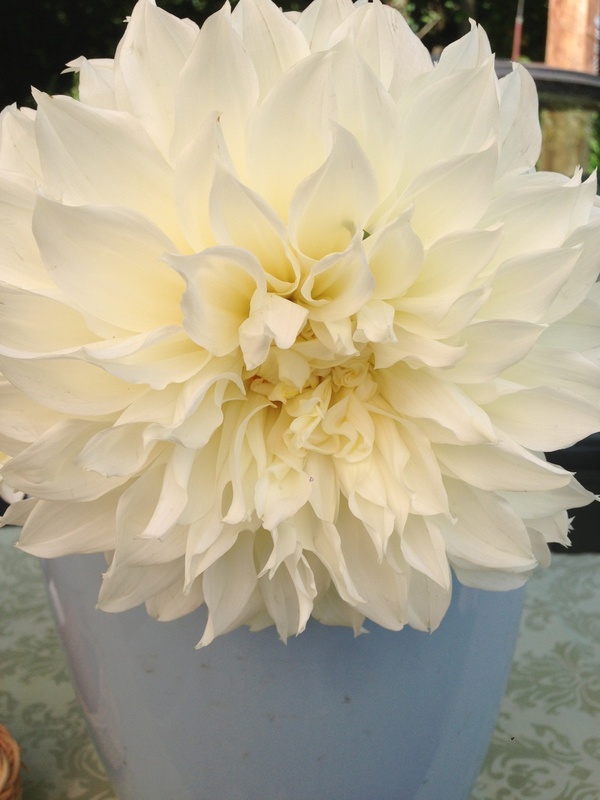 Dahlias survive the first light frosts of fall, as do many bees, which end up spending the night on the blooms. As a rule, I will not cut a bloom with a resting bee. Come cool days and nights, I often delay my morning cutting until the warmth of the sun gets my little friends wiggling and buzzing. In fact, a number of bees even survive the first hard frost, when the dahlias do not. As soon as this first hard frost hits, the dahlias are immediately done for the season as far as cut flowers go. For two weeks or so in mid- to late-October, I do nothing, but I know each of the dahlia tubers is hardening off underground. The leaves, meanwhile, turn brown and black. Come early November, I cut the stems to about six inches above ground. Within the week, I gently pull all dahlias from the ground by hand, and maybe the slight help of a shovel. It amazes me that what went into the ground as a single "fingerling potato-sized" tuber, emerges as a mammoth cluster of tubers, some nearly two feet in diameter, others more round, but with equally numerous new tubers attached. Digging dahlias in bulk is heavy work, as so much growth quietly takes place under the summer sun. Once out of the ground, I physically cut the clump apart (not easy work) keep one tuber per plant, rinse off the soil and write the name of the tuber variety on the tuber itself with permanent marker. For several days, I let the tubers dry in the sun on newspapers. Then, it is time to box them up for winter storage. I overwinter dahlias in moistened pet shavings place in cardboard boxes. I use clear shavings, not cedar shavings, and I mix in just enough water to make the shavings moist, but not truly wet. Too wet will promote rot. Too dry, and the tubers will shrivel and may not be as viable come spring. My dahlias "winter" in the cooler where they enjoy temperatures in the low 40's. Every month, or so, I peek in a couple of the boxes to make sure I don't have rot, or to sprinkle a bit of water if anything seems dry. Depending on temperatures, dahlia planting for the new growing season begins mid-April to mid-May. By then, rows are tilled and waiting. I put a bit of bone meal at equal intervals down the rows, and this helps me set my spacing for the tubers. Following the advice of a long-time dahlia farmer, I plant my dahlias close to the natural surface level and then "hill up" over the tubers. I do not water when I plant. It takes weeks for the first shoots to break the surface, which is long enough for me to wonder if anything is ever going to happen. Sure enough, it does, and it is always very exciting watching rows of soil become rows of dahlias! If, by chance, a late spring frost hits after shoots emerge, it does, in fact, kill off early shoot growth, but the tubers underground fare fine, and the dahlias thrive nonetheless. rows of 6" x 6" support netting. chips) at this time as well. When new shoots reach 12" to 18" I do a single "pinch" meaning I cut the stems to prompt the remaining stem to branch at the pinch point. Then, once again, I wait, as each plant pushes out more leaves, the first small buds, and, finally, sometime in late June or early July, that first fully developed dahlia bloom. Thus, the dahlia's year comes full cycle, once again, and it is time, once again, for the myriad of dahlias to shine in farm bouquets, table arrangements and the hands of many radiant brides. Ummmm.... that's a lot of dahlias and it is only one of my dahlia growing areas! Hard to believe they all start from scratch every year. A spring subscription delivery with tulips, allium, iris and lilac, among others. One of the joys of flower farming is following all the changes that take place during the course of a growing season and seeing "what's going to come next." Through the Butternut Gardens Subscription Service, many loyal customers also share in the joy of new flowers every week and the joy of anticipating "what's going to come next." I am happy to offer several types of subscriptions to meet individual interests and budgets. Quite a few subscribers receive flowers every week. Some choose to have fully-made bouquets delivered. Others choose the 'bucket' option and create their own arrangements from a mixture of loose flowers. I often hear that a number of flowers make it into the second week, although others, we know, are expectedly more fleeting. There are many times when I would love to see how the 'bucket' subscribers choose to display their floral bounty. Bi-weekly subscriptions are also popular. As just mentioned, a number of flowers last longer than a week, although I would not count on that for the majority of blooms. Flowers delivered every other week can also come as fully-prepared bouquets or as 'bucket' subscriptions. One of the most fun parts of subscriptions is that you really do NOT know what is coming next! Sure, it might be the time of year when Phlox is bountiful, but with what will it be paired? Will it be a monochromatic offering with all lavender or all pink or all white blooms? Will it be sheer Phlox ecstasy - purple, pink, white, deep pink, pink and white swirled phlox all bunched together? What special little accent flower shall I add this week? Mountain mint, perhaps? Flower subscriptions are truly gifts and surprises! The third season-long subscription option is the monthly option. Every month fresh flowers arrive at your doorstep. This seems to be the perfect floral pick-me-up for many subscribers. It is also a very popular gift item - just enough, but not too much - and a full season's worth! For many, it makes their month. Going from one month to the next, subscribers see the biggest difference in blooms, because what a difference a month makes in the gardens. It is the difference between peonies and tulips to phlox, iris and daisies; the jump from sunflowers and zinnias to dahlias and chrysanthemums. For those who are not certain about receiving flowers regularly, I also offer a one-month trial of four bouquets. This is another perfect gift item. Generally, the biggest concern about flower subscriptions is, "What happens if I want to take vacation?" I try to be as flexible as possible, and change delivery weeks or double up on flowers other weeks, to best accommodate. Somehow it all works! Many thanks to my flower subscription customers. I love growing your flowers and surprising you with what comes next.